File Types: ZIP,All Files; File Size: 1.68 MB; Columns: 2; Min Browser: IE 9+Firefox 14+Chrome 19+Safari 5.1+Opera 12+. 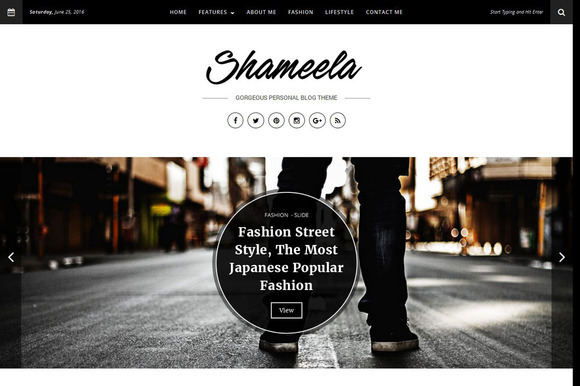 Shameela is a fresh, gorgeous & special theme for personal blogger. It comes with simple and unique layout but have a lot of options and features (3 Variant Sliders, 3 Variant Headers, 3 Variant Featured Headers Post, 3 Variant Featured Footers Post, 6 Variant Homepage Layouts, Colors Schemes, Show/Hide Elements, Left/Right/None Sidebar, Typography and many more). Shameela also very easy to customize. Please see our variant demos. And here are Special Features and Easy Customization on Live Customizer. Keywords: blog, personal, lifestyle, fashion, instagram, wordpress, wordpress theme, blog theme, feminine, lifestyle blog, fashion blog, modern, clean, slider, travel blog.